From left, in front, Gwen Varnell, Anita Stewart and Madeline Burgess. In back, Sheila Martin, Kipp Felice, Todd Harless and Joseph Keene. Miller Industries Towing Equipment Inc. donated proceeds totaling over $10,000 to the Central, TN Affiliate of Susan G. Komen foundation. 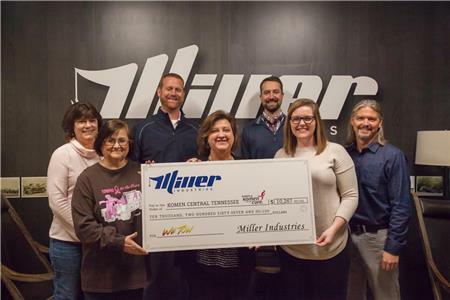 This donation came at the close of the 2017 WeTow campaign hosted by Miller Industries. The WeTow campaign aimed to raise awareness of the towing community’s support for the many charities across the nation, as well as the good deeds towers provide within the communities they serve. Through the sale of custom tow hook bracelets, Miller Industries chose to promote the awareness of six national organizations: Susan G. Koman, DAV- Disabled American Veterans, Miracle League, Shriners Children’s Hospital, International Towing Recovery Museum & Hall of Fame, and Wall of the Fallen Survivor Fund. The tow hook bracelets are available for purchase at all participating Miller Industries distributors, and the money raised from the sale of the bracelets made it possible for this donation. For more information please visit www.millerind.com or www.wetow.org.